Flying pigs and unicorns are my christmas theme this year. In white and gold. I’m tired of bad news. Time for some magic and sparkling champagne. Cheers to the coming season in spite of. Woke to the sound of downpour this morning but the sky is now brightening a little in ombre shades of mauve and blue grey. Ah November, last gasp of autumn’s splendor. November is a welcome month this year. It marks the three-month point of my twenty-three year old daughter’s recovery from a sudden, unprovoked deep vein thrombosis and pulmonary embolism. I spent much of late summer and early fall learning everything I never wanted to know about blood clots. Like many parents, I’ve gone through some difficult things with my kids, but this one pretty much took the cake. I still can’t quite write about it without a sweep of panic. Things are ok now, we’re adjusting to a new normal that includes life long blood thinners. I’ve never been so thankful for the progress of science and medicine, for kind, philosophical specialists and for healing. Learning to breathe again, to not live in constant fear, to allow the larger the world to return to focus is continuing to be a process. Striving to ‘become something‘ (an art conservator, a graduate, whatever) no longer seems as essential as simply being and being present when it matters most. 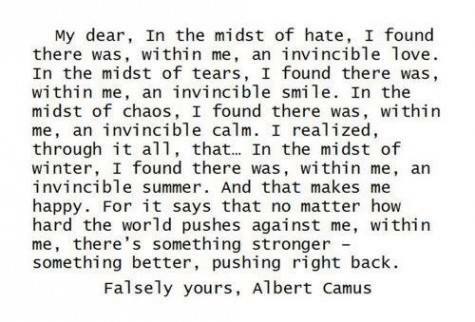 I read a lovely thing this morning written by French philosopher and Nobel prize-winning author, Albert Camus. Happy Fall. Happy Winter. It’s nice to be back.